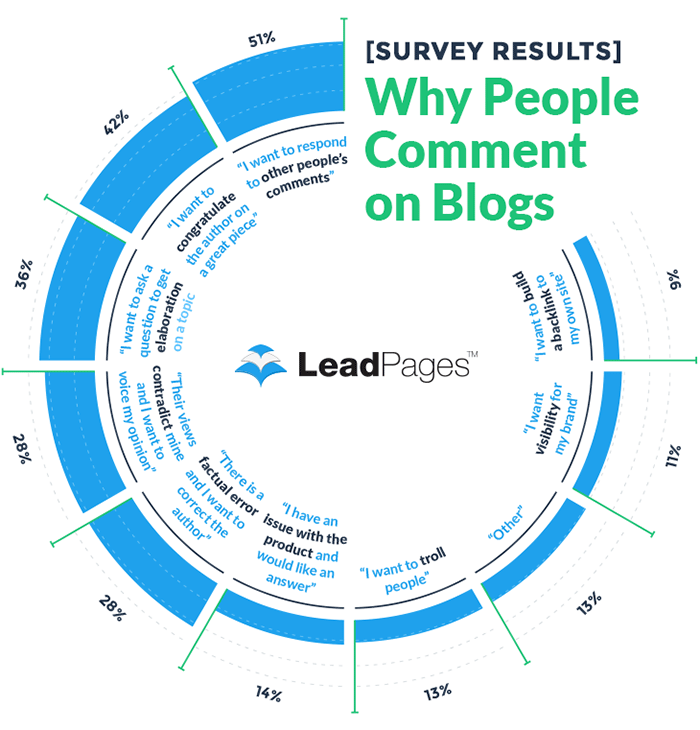 LeadPages completed a large survey to find out more about who comments and why they comment on blogs. By understanding the who and the why, it will make you more effective at interacting with the different types of personalities that decide to comment on your blog. Here are the most common reasons why people comment on blogs. As we delve deeper into the specific ways to increase blog comments, I will continue to reveal more statistics from the LeadPages survey. The results are truly fascinating. Let’s go ahead and get right into the ten best ways to increase comments on your blog. People respond well to questions, but they respond even better to commands. The problem with many questions on blog posts today are that they are closed questions. People can answer “Yes” or “No” and satisfied your request. When that is the kind of question you ask, then your visitors won’t comment because who wants to post an answer like that? Closed Question: Do you like this blog post? Open-Ended Question: What is your opinion on improving the content of this blog post? Open-ended questions invite more comments because they offer visitors the chance to express their opinion in a safe, open forum. Yet asking a question isn’t the absolute best thing you can do. What you need to offer at the end of your blog post is a call to action. Tell me something that has worked for you on your blog lately. Let me know what has worked and what has not worked for you with this format. Share the 3 best ways you’ve generated more comments for your blog. The goal here is simple. People love to share their personal stories. You need to encourage them to leave those stories in your comments section. Closed questions won’t get the job done. Give every blog post a call to action and you’ll start to see better results. Until you discover how to market your content to your targeted audience, there’s a good chance your best content is going to languish with only a few comments – if it receives any at all. People today want content that is easy to consume and is even easier to implement in their own lives. This is why the list article format has come to dominate the internet. Top list posts hit the top issues that people are researching in every potential category for the subject material for your blog. Here’s why they are so effective. They are keyword orientated. If you’re searching for “the best blog comment improvement strategies,” then an article titled “The 15 Best Blog Comment Improvement Strategies” will attract the attention of a prospect. They promise value. A list article promises multiple value opportunities for the reader. You’re not just getting one piece of good advice. You’re getting 15, or 30, or 101 – you choose the number. They are easy to read. Top list posts help visitors pick out the best advice for them in the content right away. This is because they can skim the headings, pick out the key points they’d like to consume, and them immediately implement the advice which has been offered. The key to a successful top list post is to make it personal. Offer your own stories. Don’t try to sound like you know everything. Life is a journey and we are all always learning something new. Take that kind of attitude into your post and you’ll see more people will to engage in the comments section of your blog. When someone randomly gives you a compliment, it makes you feel special, right? It creates a lasting impression. This is especially true when it comes to your specific industry or passion in blogging. There are hundreds of bloggers just like you who are trying to improve the interaction they receive on their blog comments. Giving people a mention on your blog and using them as a reference to make your key points can help you to engage like never before. Here’s why: people will often leave a word of thanks when you give them a mention and put a link to their blog within your content. When that happens, you’ve got a chance to reply to that comment to keep the conversation going. This conversation gives visitors a chance to get to know both of you a little better and it encourages them to get involved as well. Here are 3 tips to help you make the most of this method to increase your blog comments. Make sure to mention their full name or their preferred authorship name and always provide a link to the content you’re referencing. Address the person you are mentioning as one of the top experts in your subject material, including the use of an official title if one is available. If one is not, “Founder of [Insert Blog Name]” works pretty well. Shoot the person you are mentioning an email to let them know you’ve linked their content to your new post. Sometimes a visitor doesn’t want to skim through a full list of key points. They might have 60 seconds to offer your content and they want the most value possible out of that time. If you can attract their attention in that short amount of time and give them something valuable, then you’re more likely to receive a comment – and a repetitive visitor. For this reason, the best blog posts to generate comments have multiple forms of media options contained within them. This means digital graphics, photographs, and videos. You don’t need a super massive video to make a huge positive impression. Videos that are under 10 seconds in length will maintain nearly 90% of a visitor’s attention span. This is why you must go beyond the written word. Did you know that less than 10% of what gets communicated to you every day comes from written words or speech? This means that more than 90% of your communication skills come from non-verbal techniques. Your tone of voice and your body language are 9x more important than what it is that you’re actually saying. Think about it this way. If someone is standing in front of you, arms crossed, and they have attack eyebrows in place, would you accept an invitation from them to have lunch? Probably not. If that person happened to be smiling, a glint in their eye, and offered to take you to lunch to discuss how to improve the number of comments your blog is generating, you’d be more likely to accept, right? Right. Although a blog is mostly written words, we still attempt to generate emotions and a tone of voice from those words. We do so as a way to “interpret” what we feel is being communicated to us. If you can master your skill in communicating through the non-verbals we all key on through your blog, then you will engage people like never before. So how do you create emotion or communicate non-verbally when your blog is so focused on words? Use emotion-related words. I’d “love” to get your perspective on this key point. Invite sharing. This content makes me feel awesome. How does it make you feel and why? Keep it going. Writing comments on a blog is like going to a party where everyone is a stranger. Most people won’t grab a drink and strike up a conversation the instant they arrive. Once they’ve grown comfortable with the atmosphere, and maybe had some liquid courage, they’ll start to share. Keep writing and you’ll create comfort. We are passionate. We are all experts in our own experiences. We value communication above everything – although pizza and ice cream might be exceptions to this. Tap into these emotions and you’ll create a culture where people will want to share. Speaking of how we value communication, it is important to make sure information isn’t traveling on a one-way street. To have a conversation, you need to have more than one person talking. That’s why it is so important to respond to every comment that your blog is able to generate. But it takes so much time to respond to every comment. It’s still time that is worth the investment. Even if all you’re doing is acknowledging the fact that you’ve seen the comment and appreciated the time someone took in leaving it, you’re validating the experience your blog is able to offer. You’re also communicating to future visitors that you will be there to answer a question in your comments section if it gets left. Some might say this validation shows that you care about your visitors. What you’re really doing is creating a sales exchange by responding to each comment. In exchange for a comment, you’re willing to offer more free expertise. In our current information economy, that’s a valuable transaction which is difficult to ignore, especially if the visitor to your blog shares your passions. When we are sad, upset, or even angry, then this taps into a core emotion that connects well with others. These may be thought of as negative emotions, but what they really are is fuel for the blogging experience. When we talk about how we are able to overcome a difficult situation, then we can offer evidence to others who are feeling the same way that there is a path toward positivity. This type of content is extremely powerful because it taps into the personal experiences of the visitor as they are reading your story. It creates the foundation of a relationship because the visitor feels like they are connecting with you on a personal level. What do friends do on a regular basis? They speak with one another. This is why being an overcomer can be a wonderful way to increase the number of comments that your blog receives. It is true that this kind of content can be difficult to write. Yet there is also a certain release and joy that comes from sharing your most difficult stories and experiences. Here are some key points to keep in mind about this type of content so you can really tap into the empathetic response. Don’t leave any details out. You must be 100% authentic when you share your storing of overcoming a difficult situation. Why? Because your visitors are going to replicate your responses to see if it will work for them. Make it about the reader. It’s easy to make this type of content be self-serving. Remember what your end-goals happen to be. You’re helping others. Address the situation a visitor may be enduring so they have a chance to discover the light at the end of the tunnel. Tear down walls instead of building them up. Use this type of content to help motivate people. It’s very easy to encourage them to build up their own walls in self-defense. Show them that they can be successful. We have our own personal truths that are important to us. We all feel like we’ve found or are searching for our one path in life. We share our expertise because it is what our experiences say is the right course of action. Sometimes what we feel is right can be controversial if it goes against what the accepted standards happen to be. Offering an alternative can be a magnet for blog comments. When people feel like they are 100% right and you are 100% wrong, then they are much more likely to leave a comment. Then others will join the conversation, either to defend your perspective, offer their own, or support the person who believes that you’re wrong. This type of content can be very rewarding, but it can also be quite damaging if you don’t treat it with care. Always make sure you take the time to completely research your topic of choice. Be respectful of others, even when you feel that you’re completely right, and do your best to steer clear of picking on someone. Whenever there are data points that support your opinion, use them and use links to take people to your source material. Then you’ll want to avoid these common mistakes when sharing something which may be considered controversial. Don’t make it an us vs. them conversation. The best posts are ones that invite all perspectives without being judgmental. Avoid using inflammatory language which may damage the credibility of the data you are sharing because it will discount the value of that data. Try not to discount the opinions of others. There is always something good that can be taken out of every perspective. So if being controversial is so beneficial, why can it also be potentially harmful to your goal of having more comments left on your blog? The issue here is that if you really are wrong, then you’ll lose a certain level of your niche expertise when offering your opinion. You’ll still have people who love your blog, but your online reputation will need to go into repair-mode. Why do people decide to click on a link to see the content it contains? Because they are curious. They have encountered a potential value proposition and they want to see what it is. Don’t underestimate the value of a good headline when working to increase blog comments and visitor interactions. If your headline is authentic and interesting, it will improve the chances of earning a click. If your headline is pushy, deceitful, or clearly linkbait, however, then you are much more likely to drive visitors away. Or worse, as Joshua Feuerstein has been discovering on Facebook, where people will comment on the social media site what the content is about so other visitors don’t have to click on the link. So what makes for a good headline? They tend to be neutral in nature, include the keyword of your thesis, and communicate some level of immediate value so the curiosity generators of the brain begin to turn. Here are some examples. Up to one-third of your visitors will want numbers in your headlines, but that doesn’t mean every single post needs to have a number in it. Vary your content to reach your entire audience and you’ll see more interaction from your comments section. That way you’ll have meaningful comments instead of visitors who feel like they were deceived into a click and leave with a negative first impression. The best part about creating a content series is that it keeps your blog at the top of your reader’s mind. They will anticipate the next content that you publish because you are promising a continuing value. It’s like waiting for the season premiere of your favorite television show when you’re left with a cliffhanger at the season finally. Why use this tactic? For starters, we come back to the attention span of the average reader on the internet today. Most people don’t want to spend 15 minutes consuming 5,000 words of content in one setting. It’s be like eating three huge slabs of prime rib at the same time. It tastes great and you want more, but you’re full after eating the first one – you push the other two slabs away or ask for a container to take it home with you. This is how your content operates. It must be served in appropriate proportions. This means you can create 3-5 posts instead of one, generate many more comments for your blog than just one post would provide, and that can generate a number of additional leads compared to what you would have received otherwise. Always stay passionate about what you are doing. Your passion will attract visitors to your blog because it is so contagious. Mix that passion with your experiences and you’ll create authentic content that people will want to read, reference, and share with their friends. This is the foundation upon which you must build using the techniques shared above.